Provides a secondary barrier to help keep water out of the home. Owens Corning® ProArmor® Synthetic Roof Underlayment with Fusion Back Coating Technology™ is strong, durable and repels water unlike #15 felt. It’s also light, easy to install and contributes to safe working conditions. ProArmor® Synthetic Roof Underlayment is part of the Owens Corning® Total Protection Roofing System®^. Coverage (with 3-in. overlap) 929 sq. ft.
* See actual warranty for complete details, limitations and requirements. A longer limited warranty term applies when ProArmor™ is used in conjunction with Owens Corning® Roofing Shingles. 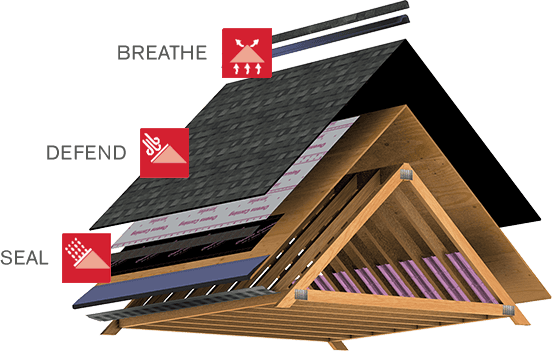 ASTM 108/UL 790, Class A Fire Resistance - Underlayment is tested as part of a roof assembly that includes wood decking, underlayment and asphalt shingles.